The Sampo was the first typewriter ever to be produced in Sweden. It shows a remarkable resemblance to the somewhat earlier German Hammonia, but the mechanism is totally different. The Sampo was produced by the Husqvarna Arms Factory, that, like Remington, also made a name for itself with sewing machines. The inventor of the Sampo is said to have been one dr. Raphael Herzberg of Helsingfors, who also place the production order with the Husqvarna factory. He acted on an order for 500 of these machines from Finland. The Sampo is also known with the name Finnland, but it is not known if that name is related to the Finnish order. The Sampo is an awkwardly impressive machine, with a large type sleeve/linear index in one piece. The character was selected by turning and shifting the sleeve. The type printed onto the narrow platen that was place centrally along the base of the machine. Inking was done by ink pads, placed in the upper and lower halfs of the machine. Hundreds, rather than thousands of this machine seem to have been produced Husqvarna, but development of the machine apparantly went on during production. 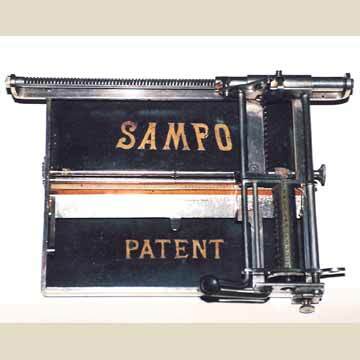 In a special survey conducted for the Virtual Typewriter Museum and the Typex newsletter, collectors Fernando Costa and Flavio Mantelli produced an inventory of differences of the Sampo. They identified 14 surviving machines that differed in the decoration on the base, the escapement mechanism, ink pads, pointer, platen and carrying case. Of the 14 machines, with serial numbers ranging from 206 to 1287, the two earliest had a more elaborately decorated base than the later machines. Three different kinds of ink pad holders were seen, but apparently used at random, throughout the production. Very odd was one machine that sported a rubber platen. Because no other machine was found to have one, it is thought that this was a custom improvement made by the original owner of the machine. The complete overview of differences, with pictures, can be found in the May 2002 issue of Typex.